It’s not often we have to say “never mind,” but that applies to what had been potential changes to our environmental review for a new reactor in Virginia. Multiple changes in the proposed design for the North Anna application have eliminated one reason to supplement our work. 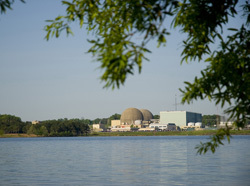 Dominion Virginia applied in November 2007 to build and operate a new reactor at the company’s North Anna site, northwest of Richmond. This would be the third North Anna reactor, co-located with the two that have operated safely since 1978 and 1980. Dominion’s original application proposed building General Electric-Hitachi’s Economic Simplified Boiling Water Reactor. The NRC’s review includes examining issues as required by the National Environmental Policy Act. Dominion had addressed many of these environmental questions by successfully obtaining an Early Site Permit for the North Anna site before applying for a reactor license. The NRC does an additional review when considering a reactor license application. We held meetings with the local community and also got input from state officials and other federal agencies. We examined all this information before publishing a supplement to the permit’s environmental review, evaluating the possible construction and operation of the GE design at North Anna. In 2011, Dominion amended its application to reflect the company’s change to a different reactor design. At that point we decided we’d need another supplement to the EIS to evaluate any changes in the previously evaluated impacts. In 2013 Dominion changed course again, returning to GE’s design. Since we’ve already documented our environmental review for the GE design, there’s no longer a need for a supplement for any design changes. We just published a notice to this effect in the Federal Register (Jan. 29, 2015). Beyond these design changes, NRC regulations require more reviews for additional substantial application changes or if significant new environmental information comes to light. We’ll keep looking for project changes or new information and we’ll prepare a supplement if one’s needed. From the recently released 2014 North Anna Annual Report. H3 still way over EPA acceptable levels in one well on site. Dominion still hasn’t found the leak in YEARS!!! Plus there are other radioactive nasties that are routinely released. The Clarifier Effluent Radiation Monitor, was inoperable from 05/13/14 until 09/03/14 and missing garden samples…. Specification 5.5.2c [10 CFR 72.44(d)(3)]. The NRC is aware that this proposed ESBWR is already not suitable for this site! The unit 3-site specific horizontal and vertical seismic response spectra exhibit exceedances at certain frequencies. Knowingly building and or continued operation of nuclear reactors in seismic zones constitutes criminal negligence. There is no getting around the fact	that PG&E has consistently downplayed	seismic hazards on	the	coast near its nuclear plants. Especially	disturbing	is that during these	past	decades the NRC has	repeatedly relaxed it’s seismic	standards to accommodate the operation of	Diablo Canyon. Was yesterdays earthquake in our newly discovered Quail Fault Zone? Earthquakes in Eastern North America are not as frequent or as well understood as those along Earth’s tectonic plate boundaries, such as on the West Coast. The magnitude 5.8 Virginia earthquake was the largest to occur in the eastern U.S. since the 1886 earthquake near Charleston, South Carolina, and it may have been felt by more people than any other earthquake in U.S. history. This comment has been brought to the attention of relevant staff. I didn’t see a response to my suggestions. What about the possibility of human error? And what to do with the nuclear waste that is not recyclable? “We examined all this information before publishing a supplement to the permit’s environmental review, evaluating the possible construction and operation of the GE design at North Anna”. A lot has happened since 2007. Our 5.8 earthquake and over 450 aftershocks pretty much proves this is NOT the place to put yet another nuclear reactor. I suggest NEW PUBLIC MEETINGS (announced in all the newspapers with in a 50 distance of NA, on the radio and on the local news channels) be held to see what the response is from Virginia citizens, about such an illogical proposition of adding a 3rd reactor in the Central Virginia seismic zone. This “new” reactor design, does not exist any where in the world other than on paper. The NRC and industry can only hypothesize. North Anna 1 & 2’s design basis was exceeded by the 5.8 earthquake in 2011. The USGS has already stated we could have an even larger earthquake. Thermal pollution . Funny how the heat waste lagoons don’t have to comply with the EPA clean water Act. The NRC has already stated high level nuclear waste can stay on site until…who knows when? The original spent fuel pool at North Anna was allowed to be re racked to hold more used fuel than it was originally designed Hence dry casks were then designed and approved to hold the spent fuel after the pool was full and no permanent repository for this highly radioactive spent fuel to go. During our 5.8 earthquake 25 of the 27 15 ton dry casks moved…some up to 4 1/2 inches. Plus the different classes of nuclear waste, A.B and C that this facility makes, need to be accounted for. What happens if the few sites that are accepting this waste now, close? The NRC and Dominion can plug in what ever numbers they want to and make it look good on paper, yet the truth of the matter is adding a 3rd nuclear reactor at North Anna in an active seismic zone, would be a foolhardy endeavor,. The risks are too great as well as the cost ~ NO 3rd nuclear reactor at North Anna!!! Attempting to run on solar, no matter how “cheap”, offers not a risk but a guarantee of total lack of output at night and especially cold winter nights. Claiming that “batteries are getting cheaper” is absurd; you’d have to get storage down from the current figure of about $400/kWh to maybe $4/kWh. No technology capable of this is even in sight. You can freeze in the dark if you want to. Note: Some verbiage removed by the moderator. I’d also add that using nuclear is really a 50 to 100 year guarantee of income for the Utility when the entire timespan of Site Development to decommissioning is considered, which makes it RISKY when new developments in Solar Energy Generation could very well make future Energy much less expensive than it is now, which would make investing in expensive new nuclear a poor long term decision, for all the ratepayers that would be locked-in to having to foot the bills for the entire lifespan of the nuclear power plant, which includes all it’s decommissioning costs. Perhaps Dominion will change its mind yet again and, hopefully, cancel plans for a new nuclear plant. I guess a wise man changes his mind but a fool never does. But it is still not wise for any utility to lay out billions for such a risky venture. And thanks Dominion for jacking the NRC around while changing your mind! You have diverted limited NRC resources that should be taking a much harder look at existing nuclear power plant safety.